When she moved to Louisiana last year, Candice Bennatt thought she had hung up her pageant crown. 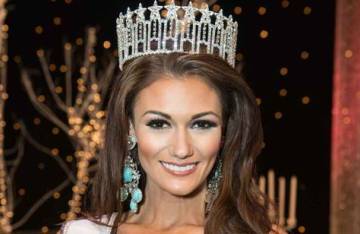 The former Miss New Mexico in the Miss America organization relocated from her native Texas to New Orleans to attend Loyola University New Orleans College of Law. But after attending the 2014 Miss Louisiana USA pageant in Baton Rouge to cheer on some friends, the pageant bug bit Bennatt once again. After much deliberation, she signed up to compete in the Miss Louisiana USA competition in October, representing Ville Platte—and won. She now goes on to represent the state, and the Loyola Wolf Pack, at the national competition this summer. "It's a huge honor, first and foremost," Bennatt said. "I love representing Louisiana. It's just the best state, with the opportunities it's given me and the things I've been able to do. The people have been so great and so supportive everywhere I go. It's just been overwhelming. I'm very appreciative." Bennatt said she had been contemplating one more title run before attending the Baton Rouge pageant when her dad, who was watching on TV, sent her a text message saying, "You should do this. You need to do this." "That pushed me over the edge," Bennatt said. Bennatt, 25, is a native of Kingwood, Texas. She earned a bachelor's degree in biology and a minor in communications from Sam Houston State University. She also was a cheerleader for the Houston Texans. While pursuing a master's degree at the University of New Mexico, Bennatt won the title of Miss New Mexico 2012 and competed in the 2013 Miss America Pageant in Las Vegas. Bennatt moved to New Orleans to attend Loyola's College of Law. She hopes to practice patent and trademark law, with the goal of becoming a television political analyst to combine her love for the law with public speaking. A victim of dating abuse as a teen, Bennatt has used her visibility to become an advocate against domestic violence, helping educate youth on preventing domestic abuse and violence.